The influence of human habitation in New Zealand has resulted in changes in land-use, the damming of rivers, the threat of fire and historically the harvesting of penguins. 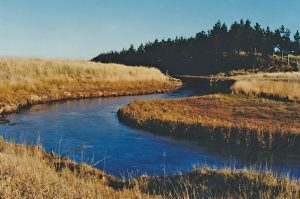 Historical changes in land-use through large-scale clearance and fragmentation of coastal forest to make way for farming has transformed native vegetation to pasture. But whilst the changing landscape has influenced their nesting habits, hoiho are able to breed successfully in modified environments. The introduction of large grazing stock like cattle and deer can create problems in hoiho habitat by trampling nests and birds (particularly chicks). Smaller grazing animals such as sheep pose less of a risk through trampling, but do browse and destroy vegetation. Fire could be devastating for a local penguin population. 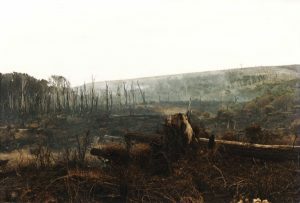 A catastrophic scrub fire was responsible for the deaths of more than 60 adult hoiho at the Te Rere Reserve in the Catlins in 1995.